Your customers will have all kind of support preferences. Some of them will want to call you. Others will look for your email address to drop you a couple of lines. A growing part of your customer base will look to a different channel: your Facebook Fan Page. Since it’s inception, Facebook has been used by customers to quickly get in touch with businesses. In their eyes, it’s fast, convenient, they don’t have to look for contact long and they can reach almost every business from a single platform. As a business, you should be ready to answer the questions streaming from Facebook with the same level of detail and care as you would do on your own website. After all, your business on Facebook and on your website is the same thing in the eyes of customers. That can get a bit tricky with the cumbersome Facebook interface that simply is not suited to creating good customer service. However, you can get around that by using LiveChat on your Facebook Fan Page. You can add a LiveChat option to your Facebook Fan Page and have it show up next to your About or Photos sections. Whenever someone accesses this option, a chat window from your LiveChat will open straight on Facebook. At the same time, one of your agents will be able to answer the chat from the LiveChat application. First off, you need a LiveChat account. If you still don’t have one, we have a free, 30-day trial you can use to give LiveChat on your Facebook Fan Page a go. You also need to have Administrator privileges on your fan page. Next, you need to go to the LiveChat on Facebook Fan Page app and click on the Add LiveChat to Your Page button. 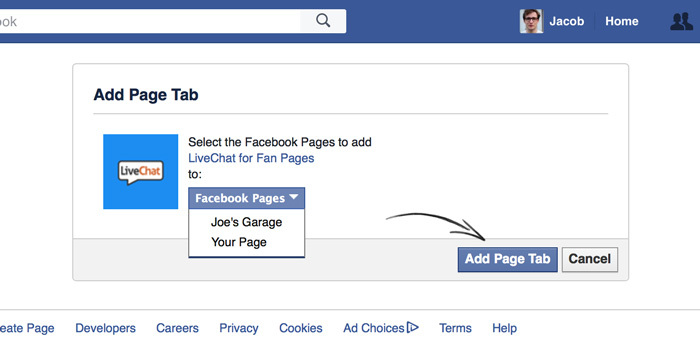 Next, you need to select which Facebook fan page should have the LiveChat option. Make the selection and click on the Add Page Tab button to proceed. Now, you need to make the live chat option more visible. Go to your Facebook fan page and click on More. Select the Manage Tabs option. Drag and drop LiveChat with us to appear in front of the About section. Finally, you need to tie the app to your LiveChat license. Click on the LiveChat with us tab (it should now appear as the first tab on your Facebook Fan Page), enter your LiveChat email and API key. From on, anyone who comes to your Facebook fan page will be able to start a chat with your agents by clicking on the LiveChat with us tab. 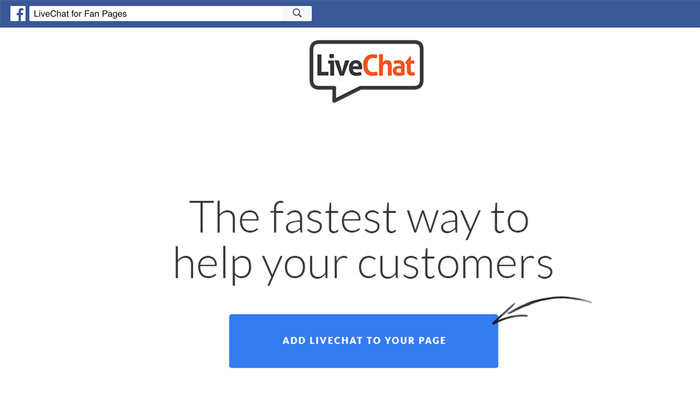 You can make the live chat on your Facebook fan page easy to use for customers by using another LiveChat and Facebook integration called Facebook Connect. The Facebook Connect integration allows your customers to log in to your chat using their Facebook profiles. So instead of typing their email and name, they can simply log in with Facebook and proceed straight to chat. And since they are already of Facebook when accessing chat on your fan page, starting a chat with your support is only a matter of two clicks. You can learn more about the integration and see how to set it up from our Facebook Connect tutorial. Having a chat option on your Facebook business page will definitely help your customer service, but what about wall posts and direct messages left by customers? There’s a LiveChat integration for that too! The Tickets from Facebook integration will allow you to receive all wall posts and direct messages from customers as tickets in your LiveChat. This, combined with the LiveChat for Facebook Fan Pages, will allow you to manage the entirety of your Facebook customer straight from LiveChat. Head on to the Tickets from Facebook integration page for more information and a tutorial on how to set it up. Although Facebook wasn’t created with customer service in mind, it doesn’t mean you should offer different level of service on the social platform. Here’s a couple of points you should keep in mind when offering support on your Facebook fan page. In the eyes of your customers, there is no difference between contacting your business directly on your website or through your Facebook page. They will expect the same level of service no matter which channel they pick. If you have different agents manning the stations on Facebook and on your website, it might be a good idea to have a company-wide policy on how to handle various customer service situations. By creating a playbook that goes over the most common situations and ways to handle them, you can ensure that all your customers receive the same, high level of service no matter which channel they pick. Customers contacting you via Facebook can be a great source of feedback. 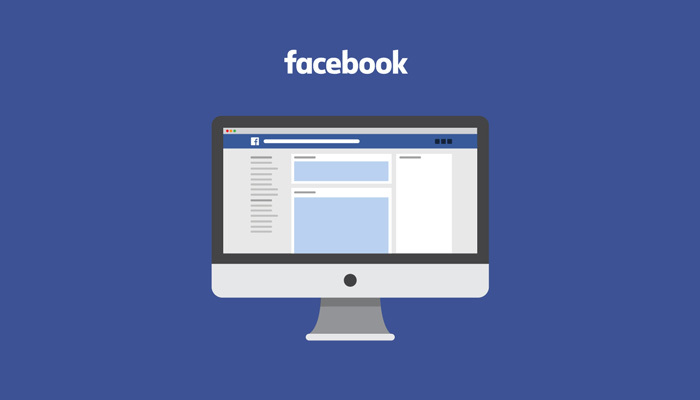 Consumers often turn to Facebook if they want to provide a testimonial or make a complaint. Keeping track of the different types of feedback you get on your fan page will allow you to further improve your product or service. One way to do this would be to create a Google Sheets spreadsheet and list the feedback there. You can group similar cases together whenever they come up. Your agents can share the document and update it whenever a piece of feedback comes through. After a while, you will have a real goldmine of feedback and ideas from customers. When responding to a chat from Facebook, your agents should pick it up as fast as they would in the case of a normal chat. Even though you have some wiggle room in terms of response on Facebook, you still can surprise your customers with blazing-fast reaction to their questions. As the Customer Service Report suggests, you should keep your chat response times under a minute for the best customer satisfaction results. Try our LiveChat on your Facebook business page and see how big of an improvement to your social customer service you can make. If you don’t have a LiveChat license yet, there’s a free, 30-day trial that will allow you to check the integration out. Feel free to share your experiences with the integration in the comments section.